Petit Design Co: Giveaway Day!! I love fabric. I love quilting. I love designing quilts. Piecing is tolerable but the actual quilting is my LOVE! Here are the details, and if you don't agree please don't enter the giveaway! I will use my stitch regulated machine and frame system to quilt on. Because of shipping (cost and reliability factors) I'm making this open to those in the US only. You must send me your quilt top by June 20th if you expect me to get it back to you before I have this baby! I will work out the specifics with the actual winner. Please do not send me your great grandmother's prized quilt or a masterpiece you want to win blue ribbons with. Remember I'm offering a simple all over design NOT custom quilting. Remember that a squared up top will quilt up a lot better than one with wavy borders. That's it! 2 possible entries. Leave me a separate comment for each one and make sure that there is a way to contact you. Giveaway will close on Sunday 5/29 and I will draw a winner on Monday. Alright, I'm first! Yes, I follow. No, I do not like doing the quilting on my own quilts. I much prefer to hand that part off to someone more qualified than myself! I do follow Quilty Giveaways. I would have you quilt a crib size for me (I'll have to choose). Sorry, to hear about your worst week ever--I'm so glad you and your little ones are safe and sound! I'm a follower and I love piecing but have never tried anything free motion yet! Thanks for the great giveaway! I follow quilty giveaways and have just put my giveaway on there! I follow quilty giveaways too. Im a follower of quilty giveaways. Other than stitch in the ditch and some outlining, I try stippling and my thread is always breaking and it's so frustrating! I've never quilted any of my quilts, just pieced them. One of these days I'll give it a go, but I love the thought of your generosity being a part of a baby quilt I'm working on. 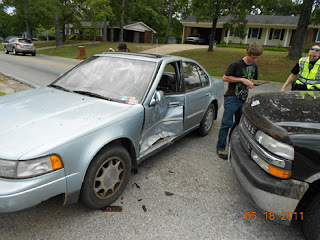 So glad the accident wasn't worse. Take good care of yourself. Whew, I know you had a terrible week. Here is hoping for a MUCH better rest of the year. I would be thrilled to have your quilting on a quilt. I am becoming more competent at it, but the piecing part is my real joy. I would probably piece a new "quick quilt" for this since my UFOs are all larger. I do have some started. Okay, so that was supposed to be two comments. Sometimes I enjoy the quilting process and sometimes it is just a necessity. I do love piecing. I think I would love the quilting if I had a longarm where I could stand and quilt. I am a follower. I enjoy doing the quilting on my own quilts, but with my normal sized machine, I can't quite keep up. Eventually, I would like to have a long-arm. I follow Quilty Giveaways. I have no idea which quilt I would have you quilt for me, but if I won, I would go home and measure all my UFOs and send you whichever one fits into your size constraints. Hi! I have quilted a doll-sized quilt, but am too scared to do it on the other tops I have done! I am a new follower, thanks so much for a chance to win! I am now following quilty giveaways. I would have to whip up a crib size quilt for you to quilt, because my finished tops are all bigger!! Thanks again for a chance to win! I already follow the Quilty Giveaways blog. I follow you. That's a lovely dresden. I prefer the piecing to the quilting. I get impatient and tend to rush the quilting because I just want it to be done. My cousin is having a baby in a couple months, too, and I've put together a nice little quilt for her, but it is yet to be quilted, so this would be perfect! I just became a follower of your blog, its wonderful and you do wonderful work. Sorry about your horrible week, thank goodness youi and your little ones are fine. I would love to have you qult the quilt top I made for the SPring Quilt-a-long I did. i'm not entering the giveaway, cause i can't quilt (well, never tried..) but just wanted to send a hug for the WWOyourL, hope it gets better, and so glad you all weren't hurt!! also... GORGEOUS quilting skills!!! I am already a follower. Recently, I have started to realize that the quilting part is not as much fun to me as is the piecing. I am amazed at what others can do just using their machine and I am flabbergasted with what people can do with longarm quilting. Maybe I just need more practice but I doubt it...lol. I think I just don't have the patience for it. Very glad to read that no one was injured in your accident. I am a new follower of the Quilty Giveaways blog. If I were to win I would like to have you quilt this http://www.flickr.com/photos/domesticass/5479059561/in/set-72157625676583361/ for me if it isn't too big. I'm also a new follower at your quilty giveaways blog! I am a follower of both blogs. I have a baby quilt with the backing just waiting for me to do, but I don't know when that will be. I am still quilting last year's Christmas present to my mom and step-dad. You are more than welcome to quilt this top if you'd like. I am now a follower of Petit Design Co blog. I am now a follower of the Quilty Giveaways blog. Thanks for the giveaway! I have a quilt top waiting to be quilted. I don't like the quilting part at all because I never can get all the fabric shoved into the throat of the machine and I fight with the quilt every step of the way. No option for a quilt top just yet, so if I won, I wouldn't have anything to send you until after the baby is born (probably). Forgot to tell you in my earlier comment, but this comment will tell you --- I'm a follower of both blogs. I'm glad to hear that you and your two little ones are OK. That looks like a really bad accident. I'd love to win, but I probably won't have a quilt to send you for a while. I hope that's OK. I love to do stippling, but so many quilts, sew little time! This would be great! Hey Norma, sorry your week has been lousy. Thanks for doing such a great giveaway! I love your blog, as always, you are incredibly talented at what you do. What a cool giveaway! I'm following you now and no, I do not like to quilt my quilts. I do it, but I don't love it (the process or the final outcome). I would MUCH rather piece! I'm following Quilty Giveaways. I have a friend's quilt top about finished; it's for her wedding later in the summer. I would love to have someone with skills (you) quilt it for me! Wow!! I have only ever done ties to hold my quilts together, so this would be a real treat! I'm now a follower! I just started machine quilting mine, I'm still on the straight line quilting, so I would love to win this! I became a follower of quilty giveaways :) I would have you quilt something fresh and girly for summer! I follow your blog. Quilting small quilts, I enjoy that. I like doing straight line quilting, and am practising free motion every week. It is nice to see improvement week to week. Large or extra special quilts I send to the long arm quilter. I'm not sure I'll ever quilt well enough for the special ones, but that is okay! This is a really amazing prize! OK you are amazing! Thanks for the chance to enter such a great giveaway. Love your blog! I am a new follower. It broke my heart to hear about your bad week. I totaled my 1 year old car with my 2 month old baby in the back by rear ending a NEW Mustang GT, who in turn rear ended a Honda. So, I feel your pain. Kiss your girls and count your blessings!! Oh, I forgot to say that I am a follower. Also, I started following your Quilty Giveaways blog. Super fun. I would have you quilt a crib quilt. I do quite a few of those!! Too bad we don't live closer. Piecing is my favorite part of quilting; quilting not so much. Sorry you've had one of those week so did my friend Gretchen. I have a Schnibbles that needs quilting. Would love for you to quilt it for me:) Take care! I follow both of your blogs! Thanks so much for organizing the Quilty Giveaways blog. I love checking the giveaways! I have a baby quilt that I'd love to have quilted. Thanks for this generous giveaway! I am terrified of quilting my own quilts. I am a follower. Thanks for the chance! thurbs8(at)yahoo(dot)com. I follow quilty giveaways. I would have to make something that small. I have a niece that I need to make a quilt for:) Thanks for the chance! thurbs8(at)yahoo(dot)com. I'm a new follower here (why didn't I know about this other half!) I'm a newbie on the quilting half of the "quilts". I'm just now getting up the nerve to learn. Getting there. I have a UFO of straight lines can you say UGH! I've been a follower of quilty giveaways. . yeah! if I were to win, I would uhhh cry! I think I would finish up the "baby" quilt that I'm making and gladly ship it to you! I follow Quilty Giveaways (RRS feed). I'd have you quilt a baby quilt for a friend or family member. What a great giveaway. I am happy that you and your loved ones are all safe. Best wishes for the duration of your pregnancy! I have been exploring my own quilting abilities on my domestic machine, but I seem to be able to piece faster than I can quilt them. I am follower of both blogs! I need all the help I can get. Thank you for a great giveaway! I followed you Quilting Giveaways! What a great giveaway idea! Yes, I'd totally trust you with my UFOs. :) I am not a fancy free motion quilter, but would love to get better at it. Best giveaway ever! I have botched so many quilting jobs that I've considered getting my patchwork quilt tops professionally quilted a thousand times. Beautiful work! What a generous giveaway! I would love to be counted in. Glad you and the kiddos are well. I want to learn how to quilt, I think I need a freemotion foot, right? I do simple quilts with hand embroidery! Thanks for participating in the giveaway - and I hope next week is MUCH better! What a great (and UNIQUE) giveaway!! I'm a new follower of your blog! I'm now a Quilty Giveaways follower! What a great giveaway. I'm in. Now a follower on quilty giveaways. Thanks to one of my followers, I found you. I'm glad everyone is okay. I would completely trust you with a UFO of mine if I win. Thanks for the awesome giveaway opportunity. First of all - I'm glad you and the kids are safe and sound. I do like quilting, but I HATE basting. This is a very cool giveaway - thanks for the chance! I've been following for a while now - sorry I don't comment much. I now follow the Quilty Giveaways blog. I'm a follower now. 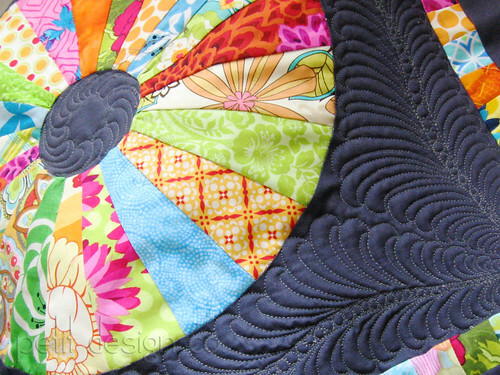 I do not enjoy the quilting part, which is why your giveaway is so exciting to me! Thanks! First, I am so glad you and your family are okay. Second, wow, what a giveaway! I would love to have you quilt a quilt for me. I try to do my own, since one day I would love to do someone else's! Luckily, I have a few quilts all ready to go! I hope your week gets better. I am 30 also and people always think I'm so much younger. It used to be a curse, now I think of it as totally awesome! Oh, and I'm a new follower. I am a follower of your blog! Thanks so much for such a WONDERFUL giveawy! My passion is piecing and I havn't mastered the whole stippling yet but i love it! Hope your week gets better! I am a follower of Quilt Giveaways as well! This is an amazing amazing giveaway! thank you for the chance to win! Fun! I love the idea of just sending it off to you. I am a new follower. I would love it if you would stop by my blog and say hi some time. Hi - I am so excited about your giveaway (and glad you are ok - hope the 15-year-old's parent knows he needs more driving lessons!). I'm now a follower, and I'd love to win because I am pretty awful at machine quilting. I love hand quilting, but that's unrealistic for as many quilts as I hope to make someday! I'm now also a follower of quilty giveaways! Thanks! Became a follower. I enjoy quilting on my quilts, but it's so time consuming, I procrastinate. Following Quilty -- I will send a baby quilt I am making for a friend. I would love for you to quilt something for me!!! Hope I win! I'm a follower for sure! you are the sweetest thing for offering to finish a ufo! your samples look beautiful and I have 5 unquilted tops so this is a match made in heaven! I'm a new quilter and while I make great tops, I'm scared to death of ruining them with lousy quilting! I'm now a follower. My favorite part of quilting is the planning/cutting/piecing. I currently have 4 or 5 quilt tops waiting to be quilted. I don't mind the quilting, but it's so time-consuming on a regular sewing machine that I lose interest. I usually stick to pretty basic quilting. Someday I hope to have one of those big, fancy quilting machines! Thanks for a creative giveaway! I'm a new follower. Weird because I've been a follower of Quilty Giveaways for some time. I typically quilt my own quilts, but would love to send one off to be quilted. Cost is what's been preventing me from doing so. I have a quilt here that I made for a cousin's wedding last year, and I still haven't gotten it quilted. I started hand quilting it, but quickly put it aside. I'd love to be able to get it quilted so I could give it to her for their 1st anniversary. Thanks for the chance to win. I'm a follower of Quilty Giveaways. I have a queen size quilt top that needs to be quilted. It should have been done a year ago, but I just couldn't bring myself to hand quilt that monster. I started, and that's all the further I've gotten. Thanks for the giveaway! I'm so glad no one was injured in your accident. You are super awesome and amazing for offering this up! With that said, I can't really say if I enjoy doing the quilting on my quilts, because I've only quilted one.. and that was my son's quilt that I did in random straight-ish lines. I have a Grace Quilting Pro frame that I can quilt up to king size quilts with that I got for a steal from the local classifieds; however I don't know how to use it yet. One of the ladies at my LSQ promised me she'd teach me how to use it when I'm ready for her to come over and teach me; but I need to organize and clean my tiny sewing room first. And I need to get my machine serviced; it somehow got knocked off center. I'm pretty sure that once I learn how to use it, I'm gonna love doing my own quilting! I'm now a follower of Quilty Giveaways. If I win, I will have you quilt up my Kaffe Fassett coin quilt! I've got the backing and the top ready, but I haven't done it yet because I got sidetracked with more pressing projects. http://www.flickr.com/photos/wambers-whimsies/4899236914/ this is the partially finished top; however I've added sashing to the left and of course the top and bottom. I am so glad you are ok. I am already a follower of Quilty Pleasures blog. Thank you for the amazing giveaway. I am now a follower of this blog too! Again, I'm so glad you, your 5 year old and the baby are ok.
Wow, what a fantastic giveaway! I am now following your blog, and I actually can't figure out, for the life of me, how to do anything creative with the quilting for any of my quilts, so I've only ended up stitching in the ditch, or doing straight outlining. I'm the opposite of you, it sounds like - I adore piecing, but freeze up when it comes time to actually quilt. Thanks so much for the chance at your giveaway, and glad to hear that you and your little ones are all ok! ...and I've also started following the Quilty Giveaways blog. I'm currently 99.8% done with a quilt (just have to finish adding one last strip on the backing, and then square everything up) that I've been making for my mom, so that would probably be what I would have you quilt. Thanks again for the chance! What a crummy week! Glad all of you are ok. I'm in Alabama! (Roll Tide). I do enjoy quitling, but I'm more than happy to let someone else do it. I am now a follower of your blog. I'll be looking around more soon! I'm from Alabama too, and your work looks amazing! I would probably like to quilt my own quilts if I had a quilting machine, but since I don't it can be a pain trying to get all those layers worked around at the same time. I'm pretty new to it all, but am quickly falling in love. I am a follower of Quilty Giveaways! I would love to win this. What a generous giveaway. Following both you and Quilty Giveaways! Once again, following you both!!! Your work is truly amazing!!! This might be a good way to get a quilt finished! haha If I win i can definitely piece a quilt and get it sent to you to be quilted! That would be awesome! I have a baby due in January so I am already feeling the pressure of ... time. I am following your blog. I am a follower of quilty giveaways blog too! OH the other questions involved... 1. I sometimes enjoy quilting my quilts... depends on the size and what kind of quilting I am doing. 2. I would have you quilt a baby quilt that I plan on making out of a charm pack that I got recently. Thanks! I just became a follower! I enjoy quilting my own quilts, and have taken one lesson on a long arm. I'm a new follower! Sorry about your bad week. Hope it only gets better. I do my own quilting, but I can't say that I really enjoy it. Which is why I've got so many UFO's! I do LOVE to have others do it for me though. Thanks for the great giveaway!! Going over to your other site to follow...will let you know! 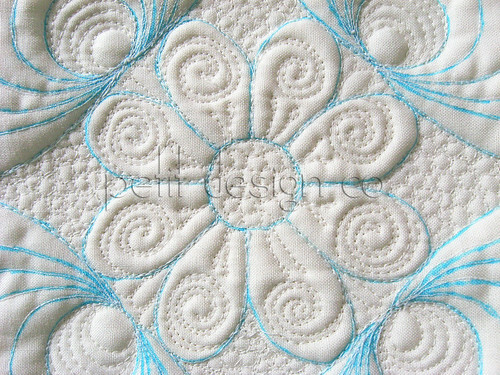 I'm a new follower of your Petit blog and machine quilting is a challenge to me that I am working on. It would be wonderful to have you quilt a baby quilt for my new grandson however. I am a new follower of your Quilty Giveaways blog and could really use free quilting on a small quilt soon. Thank you so much! Happy Memorial Day weekend.